On Sunday the 13th of January, I had the opportunity to join a guided group on the trek from West Yellowstone, Montana to view the many thermal features, several groups of wildlife, and Old Faithful. I have visited Yellowstone in the winter for over 40 years and this trek was a cold adventure! In fact, the outside thermometer on the vehicle read MINUS 36 degrees as I left for breakfast at the Three Bears Lodge. After a hearty breakfast, I drove to the Holiday Inn to meet with Bill Howell who runs their snowmobile tours into Yellowstone. Bill introduced me to Todd Stalcup, my guide. Todd introduced me to Carol and Hal Crosswait from North Carolina who would be my fellow riders on the trek to Old Faithful. Todd informed us that we would have to wait a bit to start our adventure until the outside temperature warmed to MINUS 20 or better. The minus 20 rule is a Park Service rule for allowing their employees to ride in the Park and the outfitters use the same rule. After waiting about 30 minutes, at 10am we got the go ahead; the temperature was a warm 18 below zero. Our first stop as we entered the Park was the West Yellowstone Gate. At the gate Todd presented the Park Ranger with the required paper work, including our Park Passes and Driver Licenses. The first photo stop in the Park was at a pullout along the Madison River. At the stop, we saw several white swans and a golden eagle in a tree across the river. One of my fellow riders, Hal, had great camera equipment and through the large lens I saw the eagle up close. We continued on and as we crossed the Madison River Bridge we encountered a group of bison on the road. We stopped and let them pass. You could see the cold looks on bison’s’ faces; we were that close! We next traveled to the Madison Junction warming hut. It was great to warm up and talk with a Ranger about the “Winter Use Issue” and her feelings about snowmobiles. The Ranger agreed that both snowmobiles and snowcoaches have a place in the Park’s Winter transportation system. We left the warming hut and traveled the short distance to the Fire Hole Canyon drive one way road. As we traveled up the canyon it was filled with steam from the water traveling down the open Fire Hole River which was very warm compared to the air temperature at 15 degrees below zero. What a treat to view Fire Hole Falls with only three other riders! We left the Fire Hole Canyon drive and traveled toward Old Faithful our destination for lunch. We stopped for more groups of bisons and saw several thermal areas before arriving at Old Faithful. Our timing was great. The Old Faithful Geyser, according to the posted schedule, was going to erupt in the next 30 minutes. We parked our machines and walked through the new Yellowstone Visitor Center and out to wait for the eruption. In a short 15 minutes the geyser went off. Again, what a treat to see the eruption with less than 50 people. In the summer you could be joined by hundreds of visitors at Old Faithful! We next had lunch at the Snowlodge in the dining room and got a chance to really warm up. After lunch we left for the return trip to West Yellowstone; the temperature had shot up to 20 degrees above zero, a real heat wave. On the return trip we got a real special chance to view a lone Wolf from a distance. The wolf was in front of a back drop of vapor cloud from thermal activity and Hal’s big camera lens was great to view the wolf’s movements. Next, we again stopped at Madison Junction Warming Hut and discussed the wolf sighting with the ranger. We left the warming hut and traveled back to West Yellowstone by 4:30pm. Our final stop of the day before returning to the Holiday Inn was at the Yellowstone Park sign outside the West Gate. In closing, even though it was very cold, the Yellowstone experience is always a great trek and I was glad I had the opportunity to visit the Park in winter again for the 40th year! 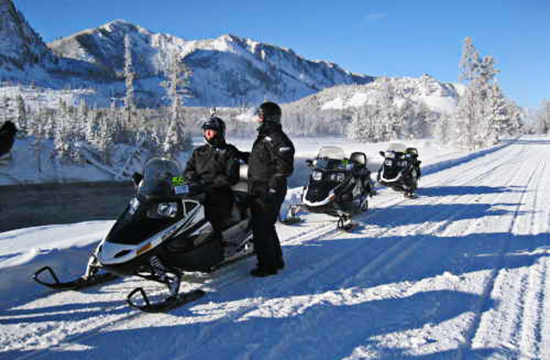 Please note, Yellowstone Park is open this winter for snowmobiles until March 15th. For up to date information on Yellowstone and the “Winter Use Issue” visit our dedicated website.